Biocam 2, now with four lenses and a reduced price. Magnify any object on your TV instantly with this hand-held camera. 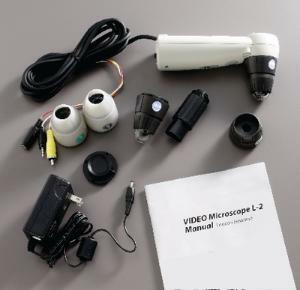 The “Touch and View” operation will instantly focus on any object that you touch with the lens, and the bayonet-mounted lenses allow you to change the magnification quickly and easily. The camera also features built-in illumination with selectable white balance and exposure times to ensure a true-color image. The camera comes with 1X, 50X, 100X, and 200X lenses, RCA cable, AC adapter and an instruction manual. Image sensor: 1/4" CCD. Total image element: 270,000 pixels. TV horizontal resolution: 300 lines. Cable length: 7' 10 1/2".